I've been gradually working through the reading list set by college before I start my course in Pastoral and Practical Theology. 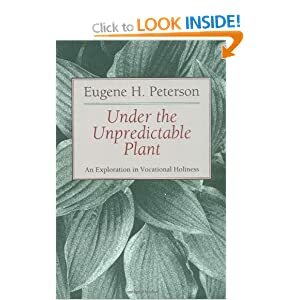 One of those texts has the unusual title Under the Unpredictable Plant: An Exploration in Vocational Holiness, by pastor, poet and theologian Eugene Peterson. I was immediately excited as I love the insight and earthiness of his very dynamic translation of the Bible, called The Message. And with many decades of experience as a pastor too, who better for me to listen to as I start vicar training on that hardest of topics: remaining holy and useful as a "professional Christian"*? The following is my review. This is a must-read challenge for pastors, and would-be pastors, alike. Pastoral work is fundamentally creative work. The section of the creed in which he set up ecclesiastical shop is the third, beginning with "I believe in the holy spirit". If this is so, if we in fact believe in the holy spirit, then we must not at the same time trying to moonlight as efficiency experts in religion. We cannot nurture the life of spirit in a parishioner while holding a stopwatch. We cannot apply time management techniques to the development of souls. Towards the end he more directly explains the need for pastors to be doing "spiritual direction" for those around them, noting the longevity of the practice, even if the inherited term for it is difficult for many. As I read more about how others suggest we should disciple others, it will be interesting to see whether there are tensions between the two approaches. And along the way he has some wonderful passages that encapsulate the work of a church leader, and many that explore the temptations unique to such leaders. And he gives some useful advice about anger. Unfortunately, parts of the book felt over-written, repeating his current theme without really adding anything. And he plays up the importance of Revelation in his section on Eschatology, but (at least for me) doesn't follow through and explain why. So this book gets 4 stars out of 5. * The term "Professional Christian" is not one I like, or will often use, but it reveals the challenge of full-time church leaders nicely, particularly as this is how others can see them.